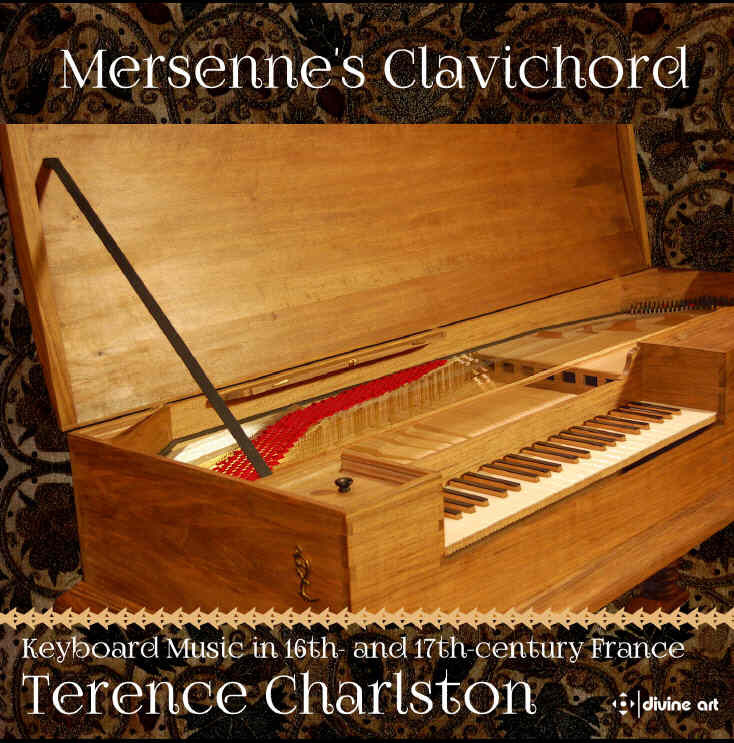 Topic: Clavichord recordings you like. Re: Clavichord recordings you like. Alexei Lubimov has recently recorded Joseph Haydn "The seven last words of Christ" on a tangent piano which uses a similar mechanism as the clavichord. It is an absolutly stunning reading of this masterpiece. This artist litterally floored me. Yes, a superb recording. I am very fond of the tangent piano. True, its mechanism closely resembles the clavichord, but its sound, to me, is more like a quiet harpsichord with dynamics! Poor description but makes the point, I think. I have some Mozart and CPE Bach on the Tangentenflügel, but this is my only Haydn. Jaroslav Tuma plays Pachelbel and Froberger on Supraphon. I think this contains some of the best performances of Pachelbel that I know, in particular a very sensitive and colourful aria sebaldina. Pachelbel recordings I like are like hen's teeth, which makes the recording particularly valuable to me. The longest piece on the recording is tagged as suite in G major by Froberger (I need to check whether this is correct, I have a doubt), which Tüma plays with lots of rhythmic rubato, but to my ears the result does not sound particularly natural or expressive. Tüma has recorded another Froberger CD, and I had some reservations about that too. Johannes Bogner plays some very well known Domenico Scarlatti sonatas on a Christofori clavichord. He plays beautifully and expressively. The clavichord is percussive enough for the music (surprisingly.) It's a top quality Scarlatti CD despite the unimaginative selection. The recording was a revelation to me. One trait of the Christofori clavichord is that the timbres in the bass is very different from the treble. So the voices are separated out really clearly. 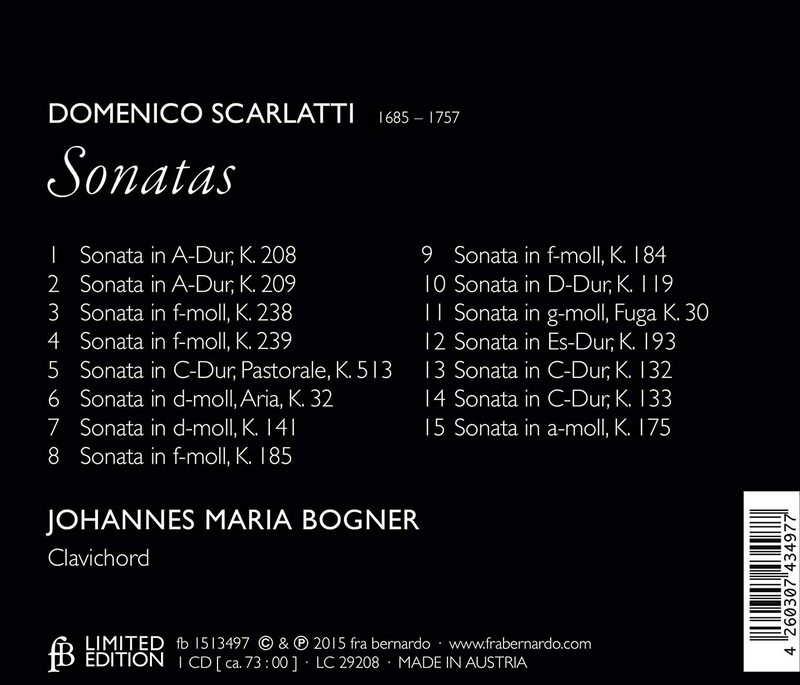 And that shows that whatever Scarlatti is doing in these sonatas at least, he is NOT writing music which is particularly interesting from a polyphonic point of view. Scarlatti is a high baroque composer, a galant composer. Maybe I should have seen that before, but it took this recording to make me grok it. 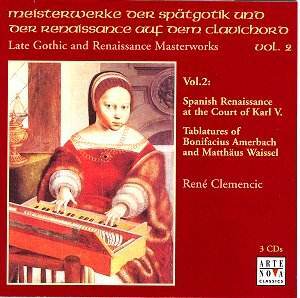 The boundary between clavichord and lute are explored in this, the second volume of Gothic music by René Clemencic. The music from all three CDs in the set were taken from lute anthologies, and appropriately Clemencic has chosen an instrument where you could almost imagine he is plucking the strings with his hands. It is marked by extremely colour saturated tones, almost hyperreal. 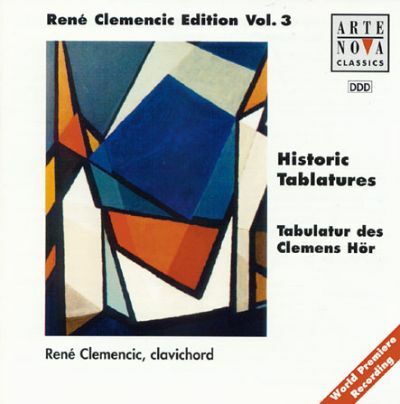 Most of the music works by rhythmic variation, and Clemencic is a master. What Clemencic does which is so impressive is this: he lets the music respire through exquisitely judged pauses. The result is something which is introspective in extremis, and something which is alive, organic. For people who are at home with the idiom of this music, people who can enjoy the abstract style of a Froberger capriccio for example, this is IMO a majorly exciting CD. The only clavichord recording that I have (not intentionally, I like the sound of the instrument) is a fine one: Jaroslav Tuma playing Bach on restored instrument made by Johann Christoph Georg Schiedmayer in 1789. Tuned Kirnberger III to great effect in eg Invention 9, it's imaginative and expressive. These pieces suit the clavichord really well. This is Kevin Komisariuk (who has successfully recorded some Scheidt) playing a Frescobaldi Toccata on a clavichord. Bach's French Suites played here with touching simplicity and warmth by Julian Perkins, who benefits from excellent engineering and a colourful instrument. The approach is literal and devoid of irony. The voices always work together to support each other, rather than interact in a more complex dramatic relationship; the cantabile is simple and fluid; the drama is minimised; orchestral grandeur is absent; the voice is intimate rather than commanding and authoritative. Nevertheless (hence?) what Perkins does is rather enjoyable, and I can imagine someone, me in some moods in fact, would prefer Perkins over other readings. In the booklet Perkins says that he likes to imagine the suites were a wedding present, and you can see how that idea is reflected in the performance: sweet, loving, straightforward, domestic. That makes three recordings of the complete French Suites on clavichord: Tilney, Perkins and Dart. This is a post in praise of the above recording of WTC2 by Kirkpatrick. 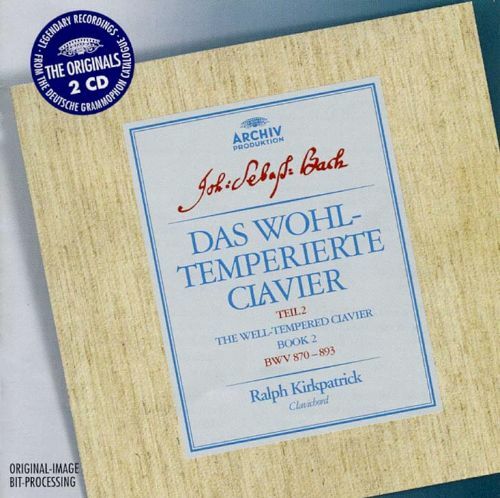 It's tempting to pigeonhole Kirkpatrick as a colourful Walcha, and that seems to be borne out by his early harpsichord recordings, especially those on revival instruments. But this his second WTC is late - 1969 - and I think it often shows him sympathetic to ideas which were current about Bach performance at the time, despite a disposable tendency to play too fast. It was recorded two years after Leonhardt's and I bet there was some fertilisation of ideas about phrasing and rhythm there. What's more the instrument is fabulous, and well recorded. Kirkpatrick may have had a bit of a swansong. I remember being very favourably impressed by his second Scarlatti recording, this time on a HIP harpsichord. He was clearly interested in Scarlatti and WTC - he wrote books on both. His book on WTC I've read and I recall nothing about it except that it was poetic, passionate. Yes. This is no nonsense. Hmm...I haven't heard Tilney. I love the Cuiller and Dupouy recordings of CPE. They really work. For some reason, to me, the clavichord on these recordings makes Bach sound more serious and dry than it should. I'll make an exception with what's on Levin's WTC. I love that. I never got Troeger at all. I love it when the clavichord works. But I have a much harder time finding the instances when it pleases me. Hmm...so...anything else going on with the Clavichord these days? No one has tried French music with it? Hmm...so...anything else going on with the Clavichord these days? No one has tried French music with it? From what I know, late Baroque French music generally doesn't work well on Clavichord (too ornamental; needs longer sustain), although a few composers did own one, probably for practice (e.g. Armand-Louis Couperin). Meanwhile, I've fallen in love with Wim Winters' channel dedicated to the clavichord. Be sure to check out his recent Partitas recording, as there are some quite eccentric (usually tempo-wise: his 2nd Partita Capriccio is the slowest one I know of, but works quite well in bringing out the affekt of the work), but beautiful, interpretations in there. Some other quite interesting things on the channel are his polemical arguments on historical tempo, or the Waldstein sonata, even a few pieces by Schubert, played on the clavichord. Yes. This is no nonsense. Hmm...I haven't heard Tilney. I love the Cuiller and Dupouy recordings of CPE. They really work. For some reason, to me, the clavichord on these recordings makes Bach sound more serious and dry than it should. I'll make an exception with what's on Levin's WTC. I love that. I never got Troeger at all. I love it when the clavichord works. But I have a much harder time finding the instances when it pleases me. Hmm...so...anything else going on with the Clavichord these daysNo one has tried French music with it? Serious possibly, but I hear tender and loving. I don't hear dry. Yes I've never got on very well with that one. The French composer (in a manner of speaking) who works well on clavichord is Froberger. A 1615 Frescobaldi Toccata played by Anna Maria McElwain -- very nice IMO. There's an essay by Stembridge where he says that these toccatas "might have been played" on a clavichord. I guess there were clavichords around. Anyway I like it. More Jaroslav Tuma; I listened to the samples and found it to be played on a wonderful instrument, but I'm wondering if anyone else has their thoughts on this. I got this when it first came out, all I can say is that it may be very well played on a beautiful instrument, and well recorded, but despite several tries (including one just now) the music never seems to "come off the page" The problem I have is something I've faced before with Tuma's latter clavichord style: he fills the music with expressive devices - pauses, different types of rubato etc - but the result doesn't actually express anything to me. This could be me of course, rather than him. Froberger needs a bit more empfundsamer style than Tuma is prepared to give it. The Froberger style I like in the later suites is more ardent, mysterious, sinuous, sensitive. Found an attractively played Bach Chaconne transcription by Wim Winters on my feed. K 310 here on clavichord from Gerard van Reenen -- IMO it sounds right.